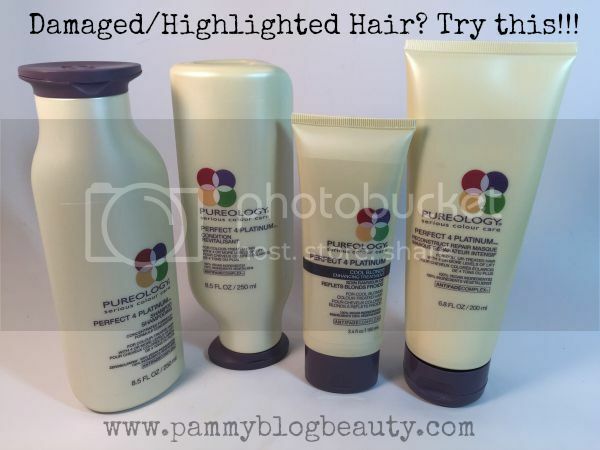 Pammy Blogs Beauty: Pureology Perfect 4 Platnium Line: A Blonde Girl's Best Friend! 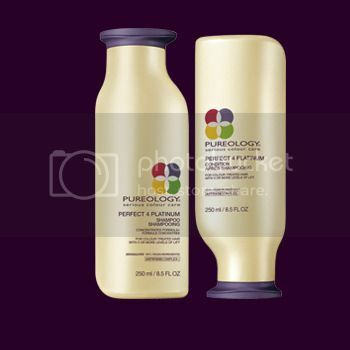 Pureology Perfect 4 Platnium Line: A Blonde Girl's Best Friend! Oh the plight of dark blonde hair. As a child I was a very light blonde. As I grew older, my hair got darker and darker until it reached a dark blonde shade. My natural color is just a plain "dishwater" blonde...not light enough to be blonde-blonde and not dark enough to be brown. It is the non-color. For me, highlights are essential. I tend to vary my highlights over time. Sometimes I go very light and sometimes just a few highlights. Yes, I have even gone platinum before. However, one thing is consistant: I am a blonde at heart and typically: the-lighter-the-better! I currently opt for hightlights. While I have done all-over color in an ultra pale blonde before, the roots were just too frequent. So, currently, I try to go as light as I can using the highlighting process. So, as a long-term blonde, I know first hand how dry and damaged blonde hair can be. I certainly do my best to take care of my ultra long blonde hair. I invest in highlights at a good salon and good products to keep my hair in top shape. Even with all of that, I do from time-to-time, end up with some damage and unruly hair. As a beauty blogger with a particular interest in hair care, I have a collection of go-to shampoos, conditioners, and hair treatments that I reach for depending on what my hair needs at a particular time. Since my hair has been quite dry lately and in need of shine and nourishment, I am reaching for ultra luxurious and gentle shampoos and conditioners and deeply moisturizing and repairing treatments. Lately, I have been obsessed with Pureology's amazing Perfect 4 Platinum line! While my hair is not platinum, it is certainly very blonde and heavily bleached. So, this product line is a great fit! To find out more details about each product in this line that I tried and how it worked for me, please click "read more" below. I am going to go ahead and tell ya'll....I adore this line! It works beautifully on my heavily highlighted and somewhat fragile and damaged hair. The products cleanse, condition, and nourish my hair leaving it much softer, shinier, and more manageable overall! There is no question that this line will be a favorite of mine in my hair care arsenal for years to come. Before diving into my experience with each product, I must tell you about the scent of the line and some of the ingredients that are used in the products. The entire line has the same beautiful and soft creamy lemon-like scent. So nice!!! Keravis: A Unique vegtable protein that replenishes and plumps keratin gaps to strengthen the hair. Organic Botanicals: Chamomile Extract (enhances suppleness and softness), Lemon Extract (clarifies and smoothes the cuticle to enhance reflect), and Coriander Oil (moisturizes to magnify shine). AntiFade Complex: A potent blend of antioxidants and full spectrum UVA/UVB sunscreens, including Heliogenol and Vitamins C & E, to defend hair against damaging free radical activity, optimize color retention, and protect from harsh environmental factors. Sulfate and Salt free formulas gently cleanse hair without stripping colour or damaging the hair. Zero Waste Shampoo and Condition packaging. Bottles are 100% recyclable. Now, let's talk about each product specifically. This gentle, detangling ZeroSulfate® shampoo cleanses and softens, while enhancing brightness and shine. I love the ultra rich, creamy, and luxurious feel of this shampoo. It actually works up a really nice rich and thick lather (which surprises me with zero sulfates!). It cleanses my hair completely without overdrying it nor leaving it feeling greasy. Retails for $27.50. This daily conditioner is so rich and thick that it practically feels like a hair treatment. Now that is a great conditioner in my book! It is intensely moisturizing and nourishing. It detangles my hair beautifully while leaving it fortified and shiny. My hair gets *so tangled* normally and this product really combats that problem! I apply it after washing my hair and I leave it on for about 2 minutes before rinsing. It retails for $27.50. I love a good hair mask...and this is exactly what this product is! It is an ultra rich deep conditioning mask that works while you shower. To use, I just apply after shampooing my hair and then I leave it on while I finish the rest of my shower (5-10 mins). I use it every/other time that I wash my hair. It nourishes hair while it strengthens (with 5x more Keravis than the rest of the products in the line). What is Keravis? It is a unique vegetable protein that replenishes and plumps keratin gaps to strengthen the hair. This masque penetrates the hair to strengthen and equalize hair's porosity. This deep conditioner contains purple tint to neutralize hair's brassy or yellow tones. This works like a charm! I much prefer my hair to have an overall "cool" blonde look. My skin is just too cool toned to look right with ultra "yellow" hair. Using this color enhancing treatment really impacts the tone of my hair in such a good way! Plus, the treatment itself is so moisturizing and smoothing that I am pretty much guaranteed to have a "good hair day" every time I use this treatment! You can use this treatment as often as you like until you get your desired color. Personally, it works best for me about 1x per week. If I use it too frequently, my hair really does start taking on a purple cast. I love, love, love this stuff! Even if you do not try out the rest of the line, this product is so perfect for color correction. I highly recommend it!!! Retails for $32.00. This is a daily blow-dry repairative lotion. It contains 15X the Keravis than the rest of the line. It works by filling in the "gaps" in the hair's cuticle leaving hair 78% stronger after just one application! It works with heat and it increases strength of your hair gradually with each use. Just apply it to your damp hair and then heat style as you usually would. I love this stuff! I love the idea that rather than damaging your hair with your heat styling, you are actually infusing a strengthening treatment into your hair!